I had just retired and was looking for something to fill my time, not just to do charity work but to keep the learning ethos on going , hence I started on the journey (I shall call it ), my knowledge of Robert Burns was very limited. As a school girl we were bused down from Paisley to visit the cottage, I was so bored I threw toffee papers at the film of Tam and Meg as they galloped over the fields. Now another hat I wear is shop assistant in the “Burns an’ a’ that ” shop in the town, we sell NTS goods and local crafters work . Its a great way of interacting with the public, I am often to be found at the Highlight Talks held in the Museum every Wednesday where one of the volunteers will give an in depth talk on one piece in particular ,it’s an excellent way of getting the knowledge to enhance the visitors experience. So I would say to anyone thinking about volunteering with the NTS, jump on board ,the journey is amazing. I am so glad I answered the advert in the Ayrshire Post! This entry was posted in Volunteer Week 2015, Volunteers and tagged 18th century, Alloway, Alloway 1759, Alloway Auld Kirk, Alloween, Burns Cottage, Burns night, Burns supper, Guiding, Highlight Talks, learning, National Trust for Scotland, Robert Burns, Robert Burns Birthplace Museum, Scotland, volunteering, volunteers, Volunteers Week 2015. 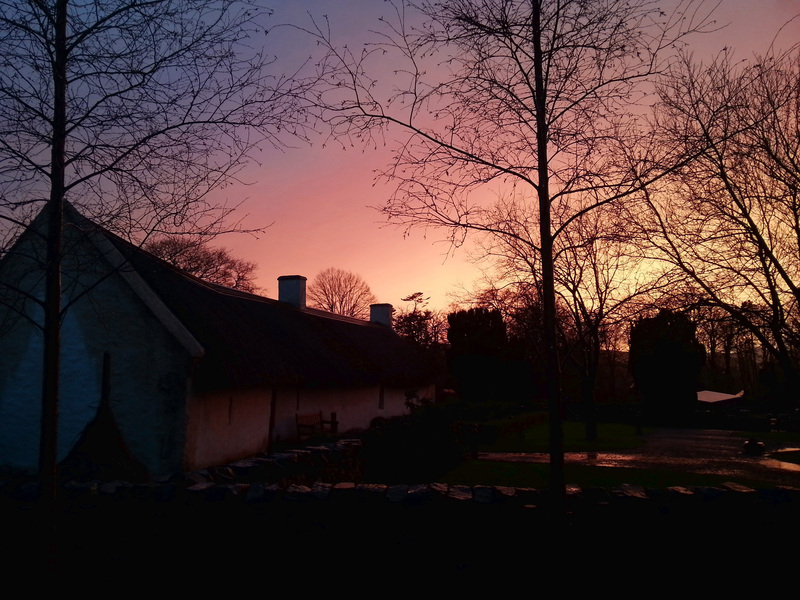 I have been volunteering at the Robert Burns Birthplace Museum as a Guide since it opened in November 2010. Being an Ayrshire Lass I was fortunate to be brought up learning about Burns, his life and his poetry. I also took part in many Burns Schools Festivals and still perform at many Burns Suppers in Ayrshire and beyond. 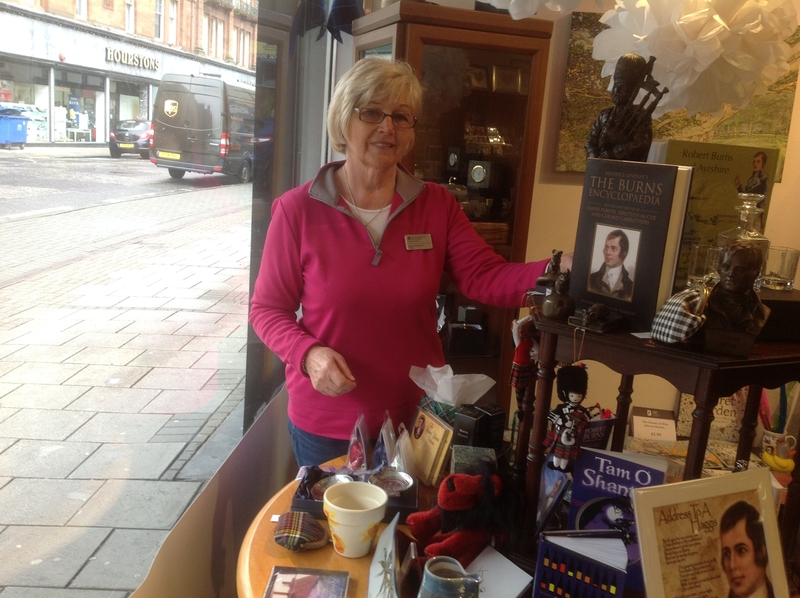 As a Volunteer I carry out many varied duties – my main one is guiding visitors around the museum, the wider site which includes the Cottage, the Auld Kirk, the Brig O’Doon, the gardens, the Monument, the Poet’s Path etc., etc. My Guiding role involves taking school parties, adult groups, overseas visitors, dressing up in costume as and when required for various events and activities – for example Evening Hallowe’en Tours, Mini Burns Suppers which are held in the Cottage and various Burns events centred around the museum and wider site in January. My most memorable experience and honour was being asked to record “The Cottar’s Saturday Night” for one of the exhibits in the museum. I carry out many varied duties but first and foremost I try to give all our visitors a memorable experience. This involves passing on knowledge about Burns – his life, family, poem, letters etc. I also inform visitors about the products and services provided e.g. brochures (for all National Trust for Scotland properties), guide books for the Museum and wider site, the resteraunt shop, Garden Shop, Education Tours, etc. Providing information, advice and assistance to visitors is invaluable. I always try to present a friendly and positive image to visitor to ensure that they are receiving excellent Customer Service and feel genuinely welcome. At the outset I want them to know they will be well looked after and receive the necessary information and an enjoyable and informative visit. Asking children if they are learning about Burns or other Scottish poets at school is so special, particularly hearing them recite what they have learnt – after a little encouragement! I inform/direct visitors to other NTS properties – remembering to mention membership of the NTS. This is so worthwhile especially for visitors who are just beginning their holiday and hope to visit other places of interest. If visitors leave having learnt something they did not know before this is so satisfying and I feel I have done a good job. Also if visitors leave wanting to return that is a bonus. I have many favourite things about RBBM – the contents of the Museum, the Cottage, the Brig O’Doon, the beautifully kept gardens. I am so fortunate to be working in such a warm friendly environment with such excellent, helpful colleges and staff. This entry was posted in Volunteer Week 2015, Volunteers and tagged Alloway, Alloway Auld Kirk, Burns Cottage, Burns night, Global Burns Community, Guiding, learning, poetry, Poets Path, Robert Burns, Robert Burns Birthplace Museum, Volunteer Week 2015, volunteering. I was one of the second group of volunteers taken on board at the RBBM. I started as a Tour Guide, moving on to driving the buggy, assisting with Craft Fairs and helping out with the Pop-up Shop in Ayr – “Ayrshire Gifts an’ a’ that”. When I heard about the role of volunteer at the RBBM, it captured my attention as I thought it would be good fun – which it is! The variety of the “job” is amazing, from taking part in events, helping with the admin side of the Pop-up Shop, assisting in the organisation of the volunteer/staff day trips, to trying to answer people’s questions about Burns (the most popular one is “what did he die of?”). I have also taken part in special events, such as Alloween, playing the part of an old witch in the kitchen. Some people may say that I was typecast !! It is difficult to pinpoint a single memorable experience, as the customers are all different, and I have a lot of good memories from meeting “neighbours” of the Museum to those from the far corners of the globe, and other volunteers from other properties of the Trust. I was also very lucky to be one of the few chosen to go on a trip to London to visit the British Museum (for afternoon tea, a private tour and then for a Museum awards ceremony that evening). HRH Prince Charles donated tickets for a Highgrove Tour and I was fortunate to win a pair too !! My one favourite thing about the RBBM …….. hmmmm, I would have to say Eric (my husband !). 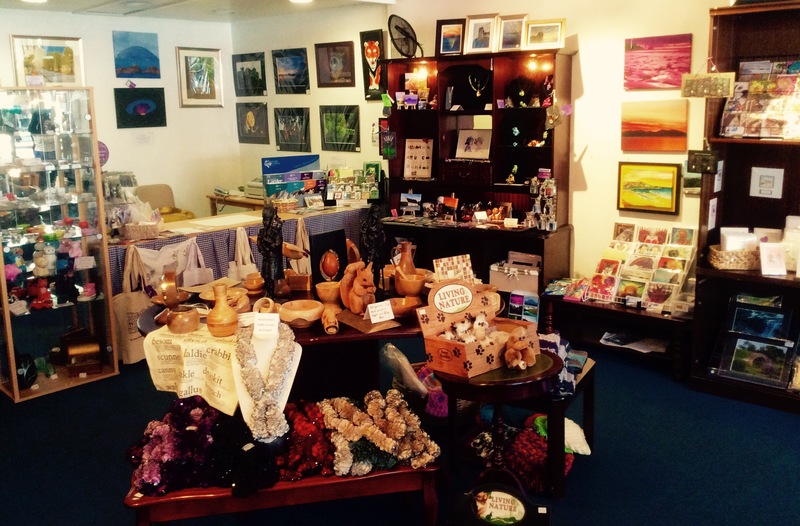 This entry was posted in Volunteer Week 2015, Volunteers and tagged Alloway, Ayrshire, Ayrshire Gifts an' a' That, gift, Guiding, learning, Pop up Shop, Robert Burns, Robert Burns Birthplace Museum, volunteering, volunteers. I have been volunteering now for over 4 years, in fact since the museum opened. I mainly volunteer at the weekend, guiding visitors round the museum. I find it enjoyable and rewarding. After I took early retirement from my employment as a Radiographer I was employed at an Historic Scotland property and I particularly enjoyed doing that. When I read about the opening of RBBM I wrote hoping they would require volunteer guides. I was lucky as training was just about to start and I was invited along to take part. I am very proud of the museum and want to make it come alive to as many people as possible. Seeing how much our visitors appreciate the collection and how much pleasure they get from their visit matters to me. It is important that our visitors take away a greater understanding of Robert Burns’ life and work. Occasionally after the tour, visitors seek me out and want to learn about other attractions in the area. I am pleased to help as it is very important for tourists to leave with the best impression possible. There is much to experience during a visit to the RBBM site and it is important to be enthusiastic and informative about everything that we have to offer. I get a lot of pleasure and satisfaction out of guiding. It has heightened my desire to keep on learning as much as I can about Robert Burns. To ensure that I have first hand knowledge of the places that were important in Robert’s life I have visited related sites in Dumfries, Kilmarnock, Kirkoswald, Mauchline and Tarbolton. I could say my favourite thing about RBBM is the Cheese Scones! Seriously I just think the whole package has so much to offer……something for everyone. Team Burns are a talented, lively group of people and I am proud to be part of it. 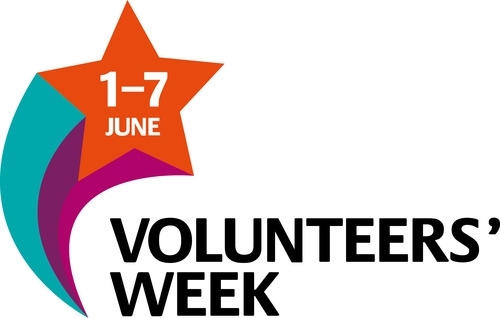 This entry was posted in Volunteer Week 2015, Volunteers and tagged Alloway, Burns Cottage, collections, Guiding, learning, Robert Burns, Robert Burns Birthplace Museum, Scones!, Volunteer Week 2015, volunteering, volunteers. Follow Robert Burns Birthplace Museum's board The Monument Gardens on Pinterest.